Creating new digital objects and eliminating copyright barriers to born digital items to ensure the availability of “raw materials” for these new modes of scholarship. The Scholarly Communication Division and the Digital Projects Division work collaboratively together and with others in the library to further enhance access to Clemson scholarship and unique materials. If you have ideas for digital projects, or thoughts on how we can support the needs of your researchers, please don’t hesitate to reach out to us! 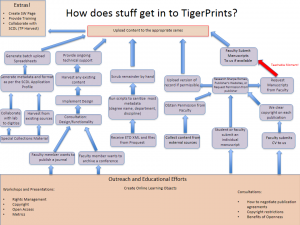 Scholarly (journals, theses, dissertations) and historical manuscript collections can be found on TigerPrints. Historical, image-based collections can be found on Clemson’s Digital Collections page.